Rick Grimes is among the few in the Walking Dead who have their humanity still intact. Even with his readiness to dispose of threats, he still remains himself. Keep that portion of him alive with the Walking Dead Rick T-Shirt. Printed with Azo-free dyes, this cotton jersey tee features the former deputy in exceptional graphics. Rick, with his iconic revolver and sheriff hat, is pictured on the back above the words Were All Infected. The front of this gothic tee features an unconventional dual-layered look. The top layer is torn revealing a graphic bottom layer that depicts the torso of a rotting Walker. 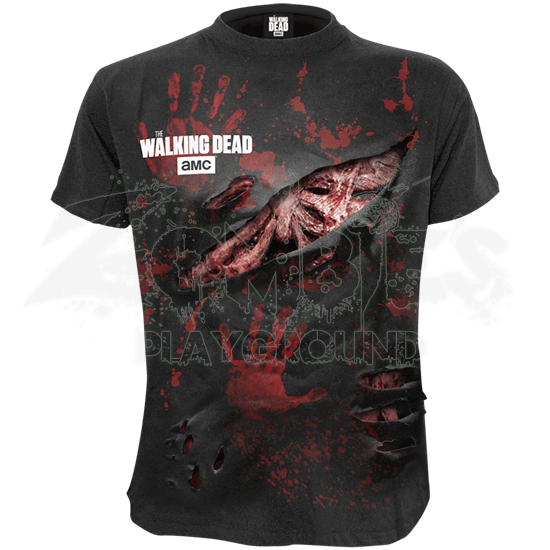 Friend or foe, the Walking Dead Rick T-Shirt is sure to leave a lasting impression!